In July, 2014, the U.S. Geologic Survey (USGS) announced that it has updated its national seismic hazard maps for the continental United States. This mapping is a graphic representation of the best and most current understanding of where future earthquakes will occur, how often they will occur, and how hard the ground will likely shake as a result (known as Peak Ground Acceleration, or PGA). According to the USGS, the new hazard maps are to be made available in late September, 2014. Historically, parts of 16 states have had a relatively high likelihood of experiencing earthquakes with a magnitude 6 or greater: Alaska, Hawaii, California, Oregon, Washington, Nevada, Utah, Idaho, Montana, Wyoming, Missouri, Arkansas, Tennessee, Illinois, Kentucky and South Carolina. 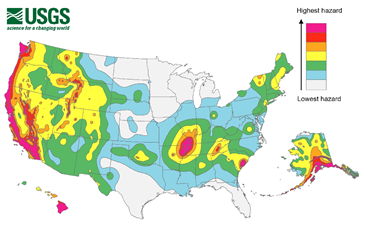 While the overall seismic hazards are generally similar to previous USGS hazard maps, some recent reported changes include both increased seismic risks for some areas of the country and decreased seismic risk for others. Most notably, the estimated earthquake induced PGA values have reportedly gone up for areas near Charleston South Carolina, and the Tennessee/Arkansas border near Missouri. Certain areas of California have had PGA values decreased, while other areas in California have had PGA values increased. These changes will be reflected in the new USGS hazard maps and data base that are to be officially released in late September. Seismic hazard maps and PGA data are used by engineers, planners, risk managers and stakeholders to assist in planning, designing for and managing seismic risk. The hazard maps also assist in developing design codes, establishing insurance rates and emergency preparedness planning. 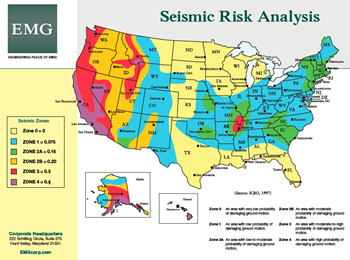 For seismic risk assessments, PGA data can be used in determining areas of the country with elevated seismic risks, as well as provide a tool for evaluating potential losses to a building, resulting from a seismic scenario event (sometimes referred to as Probable Maximum Loss, or PML). 1. Q: What is the easiest tool for identifying sites with elevated seismic risk exposure, based on the standard lender required earthquake scenario criteria; (Earthquake that has a 475-year return period)? A: In determining areas of the country that are vulnerable to increased seismic risk, the easiest non-technical resource to use has been the Seismic Zone Map as published in the 1997 Uniform Building Code (UBC), which divides the county into risk zones from 0-4, with Zone 4 being the highest risk. Most lenders and rating agencies have required seismic risk studies to be performed on properties located in Seismic Zones 3 and 4, as identified on the UBC Map. You can download a copy of the UBC Seismic Zone map here. 2. Q: What is the most up-to-date seismic risk exposure screening tool available to the public, even if it’s not the easiest to use? A: The most up-to-date screening tool for determining the exposure to seismic risk of a property is the web-based seismic risk calculator tool provided by the U.S. Geological Survey. The seismic risks are expressed as Peak Ground Accelerations (PGAs) resulting from an earthquake with a 475-year return period. PGA values are primarily used by engineers to design and/or evaluate building structures, including determining potential losses due to seismic induced ground shaking. Generally speaking, sites with PGA values above .15g, resulting from a 475-year earthquake, are considered to be located in higher seismic risk areas. This PGA criterion has been adopted by Fannie Mae for determining whether a seismic risk study should be conducted. 3. Q: What are the key changes being made in the seismic risk screening and risk assessment arena? The 1997 UBC Seismic Zone Map still represents a generally accurate representation of overall seismic risk within the county. However, due to recent advances in seismic risk data, there have been some modifications to the PGA values as determined by the U.S. Geological Survey. These modifications have resulted in some decreases and some increase of anticipated seismic risk for a few regions of the country. California, which has an anticipated PGA of less than .15g. The latest updated U.S. Geological Survey data is currently under executive governmental review and has not been fully updated on its web sites. In addition, the ASTM Seismic Guide Standards (E2026 and E2557) are in the process of being reviewed for possible proposed updates by the various ASTM Committee members. During this time of transition, EMG recommends that the standard ‘UBC Seismic Zone Map’ approach continue to be used for selecting whether a project should receive a seismic risk assessment study, unless other methods are specifically required by the client. Please be aware though, that the UBC Seismic Zone selection criterion is considered Step 1. Step 2 consists of the actual seismic risk assessment, and utilizes the latest US. Geological Survey PGA data, and therefore always remains current. 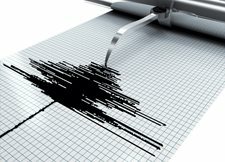 Determining a property’s seismic risk can be a confusing process, especially now as standards are being updated. If you have any questions about your property’s risk, EMG can help. For more information, contact Greg Bailey, Director of A&E Technical Operations.